#2 Terriers head to Denver today for their two-game series with the #10 Pioneers at Magness Arena. Game times are 9:30 p.m. ET Friday and 9:00 p.m. ET Saturday. The games can be viewed on DirecTV (681, Friday; 681-1, Saturday) & Dish Network (413, Friday; 453, Saturday). The Terrier Sports Radio Network also will air the contests. Colgate didn’t produce a highlights video for last Saturday’s game, so our friend, Bart Rhett, stepped into the breech and put one together. Freshman Kieffer Bellows sat down with The Trentonian to discuss his personal and team goals for this season. On Wednesday, BU received a commitment for 2017 from standout Finnish defenseman Kasper Kotkansalo, who was a member of the gold-medal winning team at last spring’s IIHF World U18 Championships. After four seasons with the Espoo Blues organization in Finland, the 6’2”, 190 lb., left-shot defenseman is skating for Sioux Falls in the USHL this season, along with 2018 recruit Matthew Quercia. Kotkansalo could be a really good get for Sioux Falls for next season, a steady two-way defenseman from Blues U20 who started to produce more points as the season progressed. He’s not flashy in any way, but he can do plenty of things well. His first pass and positioning is good, he gets shots on net through traffic and he can push forwards to the outside. His stride isn’t the prettiest, but he’s got adequate mobility and good balance on his skates. The Helsinki native, who represented his country in the 2015-16 Ivan Hlinka Memorial Tournament, had a 4-15-19 scoring line with 36 penalty minutes in 48 games for the Blues U20. In the World U18s, Kotkansalo recorded four assists in six games. “The reason why I’m going there is because you prepare to go to play college hockey. I know it’s a very tough league. It’s definitely a better league than in Finland, and that’s why I’m going there, to get tough games. “I think I’m an all-around defenseman, maybe a little bit of offensive upside. Obviously, I like to make big hits, but they don’t come so often. I can do that and make good passes. 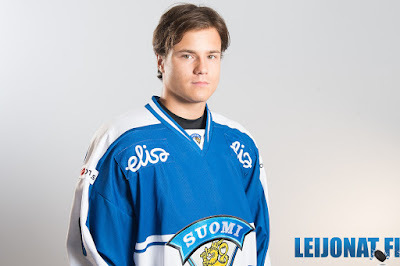 Kotkansalo was given a C rating on NHL Central Scouting’s recent Players to Watch list. The FinnProspects.com site ranks Kotkansalo as the #11 Finnish player for the 2017 draft. The Blues organization in Finland also sent recent graduate Ahti Oksanen and former All-American defenseman, NHLer and European Super Cup Champion Peter Ahola to BU. Both players skated for Terrier squads that won the Hockey East championship and reached the NCAA Championship game: Oksanen in 2015 and Ahola in 1991. ►The Hockey Analyst reviewed the U18s’ game with Harvard with capsules on each player, including BU 2017 recruits Logan Cockerill, David Farrance and Brady Tkachuk. Ahti Oksanen and former Terrier captain Garrett Noonan, who were in the New York Rangers training camp have been loaned by the Rangers’ AHL affiliate, Hartford, to the ECHL Greenville Swamp Rabbits. Both are signed to AHL contracts. 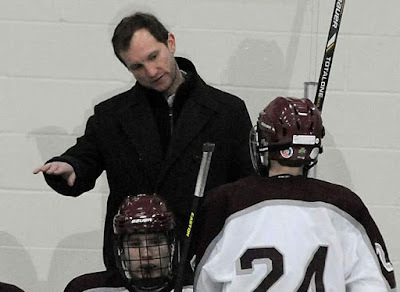 The Framingham Tab reviews the hockey playing and coaching career of Carl Corazzini, former Terrier captain, Hockey East All-Star, NHLer and now coach of the defending Massachusetts prep champion, St. Mark's School.